Diamond Cutting: The "C" that Counts! Fair to poor. It is not recommended that Maw Sit Sit be cleaned in an ultrasonic cleaner, or exposed to temperature extremes. It is also recommended that care be taken in wearing Maw Sit Sit because its hardness or durability is directly affected by the proportion and composition of the above minerals. Chromite, ureyite, chrome-jadeite, symplektite, chrome amphibole, and a matrix of lighter minerals. 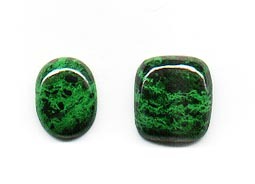 This material is opaque to translucent with flowing veins of green and black. The matrix is dark green to black in color. Veins that are emerald green to intense neon green have occurred.